It's November! Yay! November brings with it bonfires, fireworks and the beginnings of hearty comforting food! So with that in mind, why not style out your wedding to match? When trying to match a colour scheme for this theme we did struggle. The obvious choice of colours would be your reds and oranges, however we didn’t want to overdo it so have opted to tone down the brightness a little by picking navy for your chair sashes and table runners. The next thing is, does your venue have a fireplace? If so, get that fire going! Nothing says cosy bonfire night like a real fire (albeit smaller we admit)! 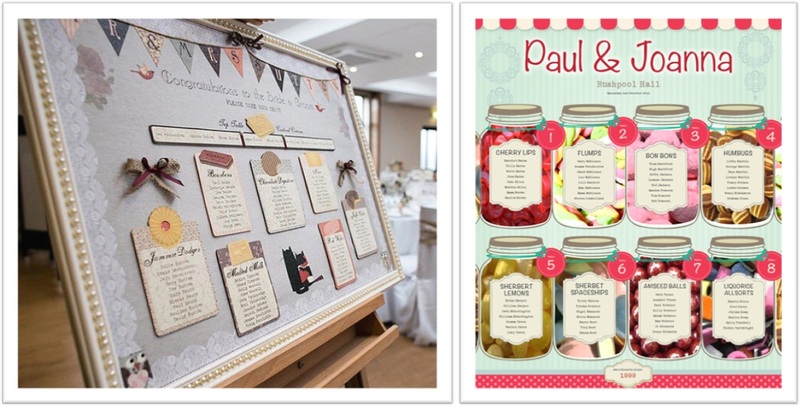 Incorporating your theme into your table plan is easy if you’re happy to get hands on and do it yourself! All you need is a big, black piece of card. Add some glitter and lots of colour, reds, oranges! How about popping on there some pictures of yourselves, the happy couple, from previous bonfire nights you’ve shared together? Make it personal! Obviously your tables will need to be identified for people, numbers can be boring so why not think up fun firework names? 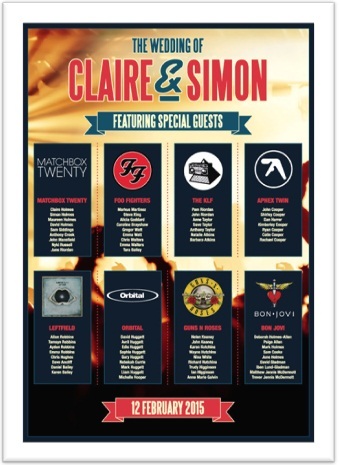 Catherine Wheel, Rocket, Roman Candle….the choices are endless! 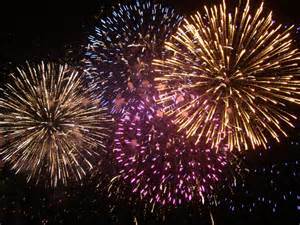 A great addition to your day would be a firework display for your evening guests (you’ll need to check that your venue allow them). 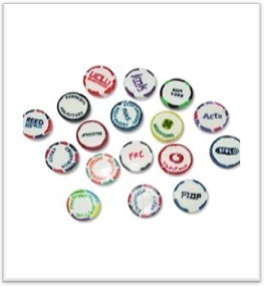 There are many companies who will provide you with different tiers of quotes and a range of different displays. The main focus of the table is your centrepieces. We figure most venues won’t allow you to have a real bonfire on the table (some people have no imagination!) so why not get yourself a tiered glass cake stand and fill it with tealights? We found these stands for £11.99 each. Tealights can be found at Tesco for just £3 for 100, bargain! 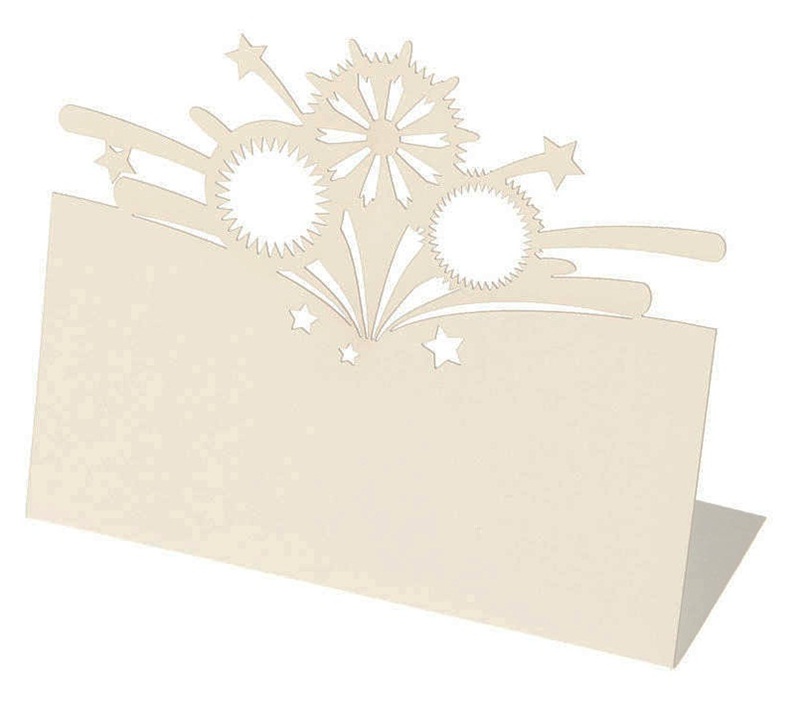 We found these cute namecards to compliment the navy of the table that are firework themed and just £7.20 for 10. What’s great about these is that they have the space for you to pop down peoples menu choices on the inside; someone will always forget what they’ve ordered! For the favours why not provide everyone with a sparkler to be used after your meal has finished? We found them for £2.40 for 10. With most weddings you will find there’s a lull after your speeches while everyone grabs a drink and prepares themselves for the party ahead, what a perfect opportunity to head outside for some more photographs of sparkler fun! 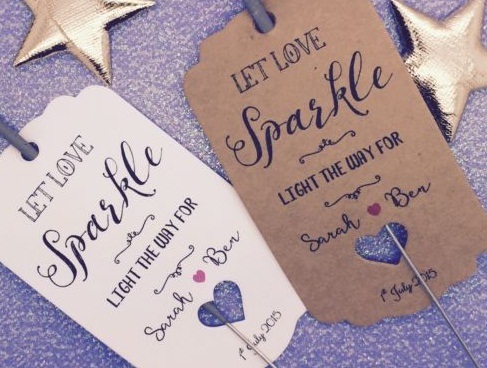 We even found these cute personalised sparkler covers for £0.99 each. Food. Big part of the day. What about theming your buffet in the evening. Bowls of chilli or stuffed jacket potato bites? 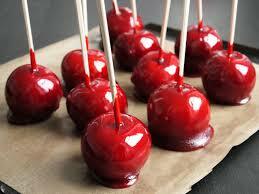 How about toffee apples on sticks for the kids? All perfect for people to munch on whilst watching your fantastic firework display! We would love to hear your ideas on a bonfire night themed wedding, maybe you've done it yourself or maybe it's something you dreamt of! Get in touch with us on Twitter @WeddingBBF, on Facebook Crowhurst ParkWeddings, on here, in a comment below or email us on events@crowhurstpark.co.uk. Or why not follow us? It would be a shame to miss out on future wedding blogs from Crowhurst Park! It’s the little details that are so easy to forget or overlook when planning a wedding, but it can be those details that make your wedding day that little bit more you! Table names can be a great way to get guests that may not otherwise know each other talking, are a bit of fun to raise a laugh and a simple way to tell your love story. So here are just six ideas to get the cogs turning to help you decide on table names that suit you as a couple! 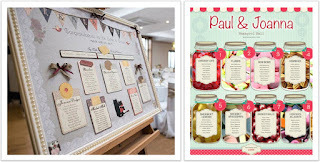 There are a number of ways you can incorporate places into your wedding table names. This could be holidays you have been on together, places you are going on your honeymoon, or more locally, places you have been on dates that are important to you, such as your first date, or first home together. Couples generally have the same taste in music, a long car journey with differing tastes in music would be difficult after all! So if you are passionate about music you could name your tables after your favourite bands, albums or even lyrics. Displaying the album covers rather than names of the bands could look fantastic, appreciate the cover art! Such as the number of months you have lived together, number of days you have been engaged, or maybe even the number of football matches you have been to see together! This table name theme is a little more unusual, so much so we couldn't find a picture! 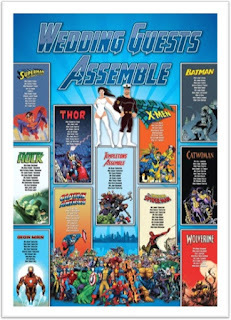 Super hero table names, such as all The Avengers is a quirky idea, can you picture it, a pretty classic wedding, with Hulk dropped in the middle! You could use pictures of them, the name, maybe in a nice font to contradict the name, or how about an actual comic book. 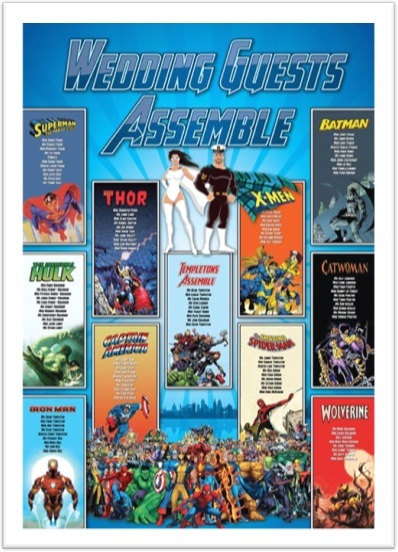 Who wouldn't want to announce “wedding guests assemble!” to gather your guests for the ceremony or wedding breakfast! Love a good board game, then why not have board game tables? 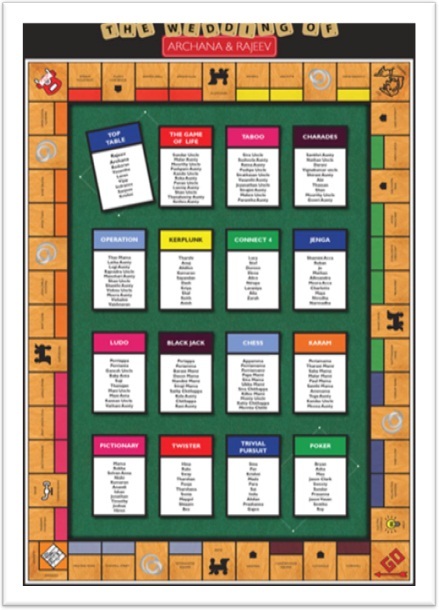 You could display your table plan like a board game, below, with tables named tables after different games. 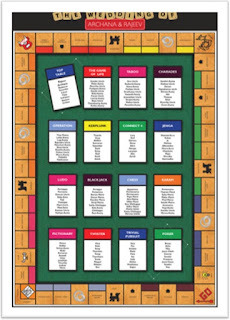 Or maybe you could name your tables after different characters, Colonel Mustard, Miss Scarlett and Professor Plum from Cluedo, or tokens from Monopoly, like the Thimble, Top Hat and Boot. You can tell we have a sweet tooth, ‘cause when we say food, we actually mean sweets or biscuits. Some people are known for their love of a biscuit, a cup of tea isn't complete without a biscuit after all! Or you may be known to love sweeties, so why not name your tables after your favourites? If you were to name your tables after sweets they could make a fun table decoration, or maybe favour, why not get a sweet cart too? The main thing to remember when choosing your table names is to stay true to yourself, if you love it, so will your guests! We would love to hear from you if you had table names, or any fun individual ideas at your wedding, maybe you could inspire a future months blog. Get in touch with us on Twitter @WeddingBBF, on Facebook Crowhurst ParkWeddings, on here, in a comment below or email us on events@crowhurstpark.co.uk. Or why not follow us? It would be a shame to miss out on future wedding blogs from Crowhurst Park! 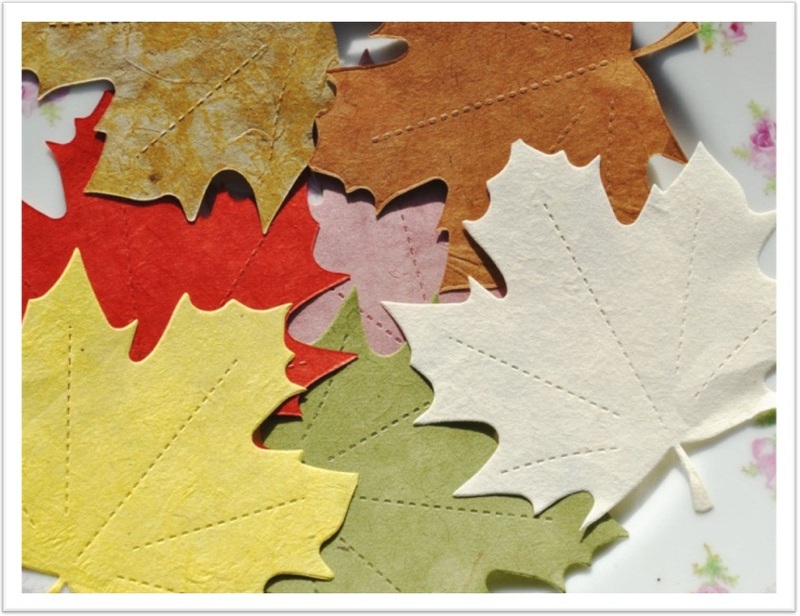 We are now fully in Autumn, the clocks have gone back, the leaves are changing to beautiful shades of orange, yellow and red and the weather has changed to bright, but a little fresh. So for this month’s wedding theme we are embracing this beautiful season, and are inviting you to “fall” in love with Autumn. Let’s start with the colour scheme, we love the mix of autumnal colours, gold’s, reds, and oranges and think it would look lovely to have all your bridesmaids in different coordinated colours of the season. For the room decoration we think a simple hessian sash and table runner would look fab, and really pull all the colour together. 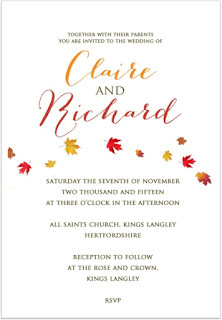 Now let’s look at the invite, after all this will be setting the theme of the day for your guests. 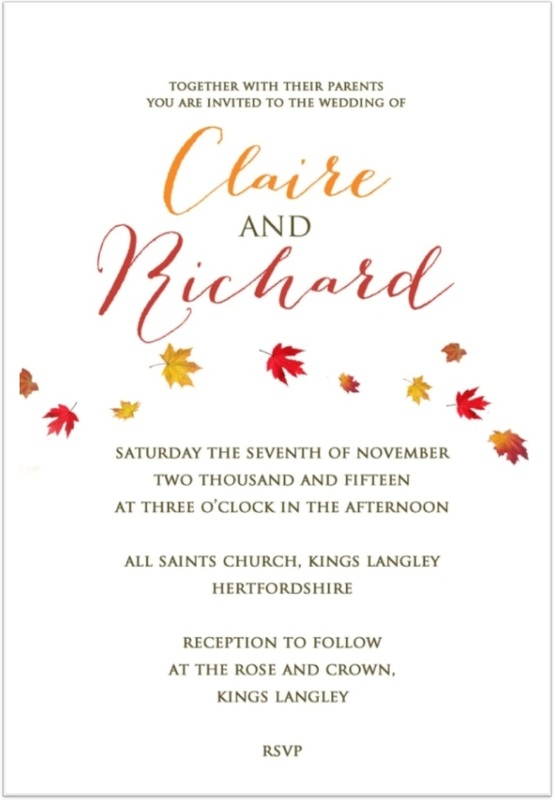 These simple invites are £6 for 10, including your choice of envelope colours, we love the brown envelope, that will really stick out amongst the bills on the door mat! Next up, the table plan. We fancied a bit of a DIY table plan. If you invest in a nice frame to mount your table plan you can use this after the wedding to frame your favourite wedding photograph. We think it works pretty well, a bit of hessian, brown card and a few craft leaves. So easy it would take longer to decide on the seating plan than to make it! And while we are looking at the table plan, what about the table names? How about trees? Oak, Chestnut, Birch, Larch, Beech and Ash. Oak is the traditional anniversary gift for 80 years, that has to be a good omen! Onto the post box. Why not use a picnic basket? 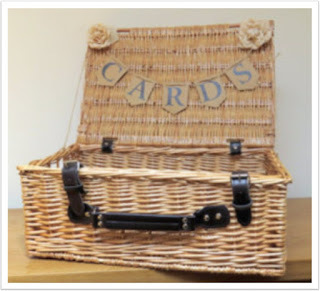 With a bit of bunting reading “cards” it works perfectly, and at £12.99 for a medium basket, it’s cost effective too. You might even have one at home gathering dust, even better! And you will want a little something from your guests to help you remember the day. Maybe a bit of marital advice, or a sweet message of how much they enjoyed the day. 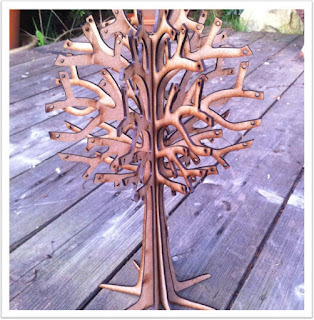 How about, instead of a guest book you have a guest tree. 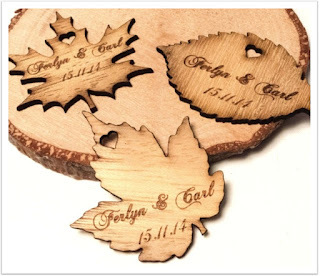 Wouldn’t it look lovely, watching the tree gain leaves throughout the day as your guests leave messages?! Autumn trees in reverse. Let’s look at the name cards now. These name cards that sit on the side of the wine glass are great for adding a bit of height to the table, pretty and functional. 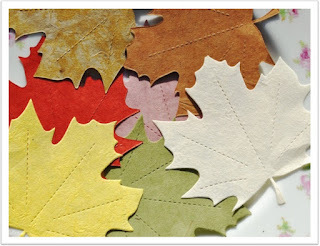 The leaf design fits in with the seasonal theme perfectly, and at £2.59 for 50 they won’t break the bank. 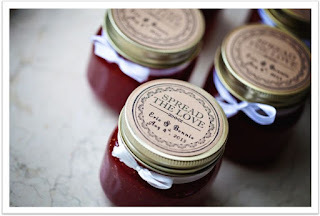 For favours we love the idea of homemade jam. A favour made by yourselves just screams “jam packed with love” (sorry we couldn’t resist!) Small jam jars are pretty well priced online, after a quick search we found 56 for £22.40. 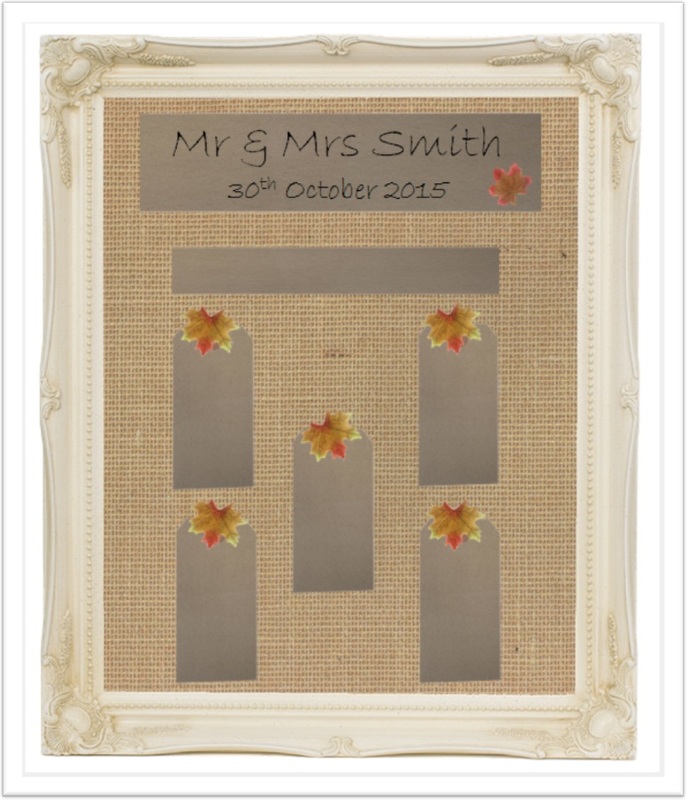 For the top table we think personalisedbunting would look lovely. And in hessian would match the table runners and chair sashes too. This would look great in your marital home, and is well priced for £13.49. 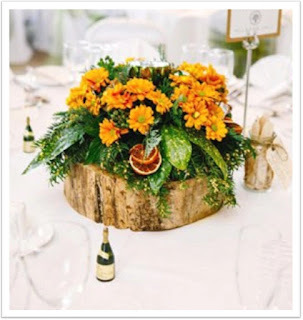 The focal point of the room will be your table decorations, but you won’t want to spend a fortune on them, either, we know costs mount up quickly with a wedding! This table decoration is another DIY job (we are giving you a lot of work aren’t we?!) simple but effective, a wood slice (the bigger the better! ), and seasonal flowers. Maybe add some candles now the days are getting shorter. Don’t fancy it DIY? 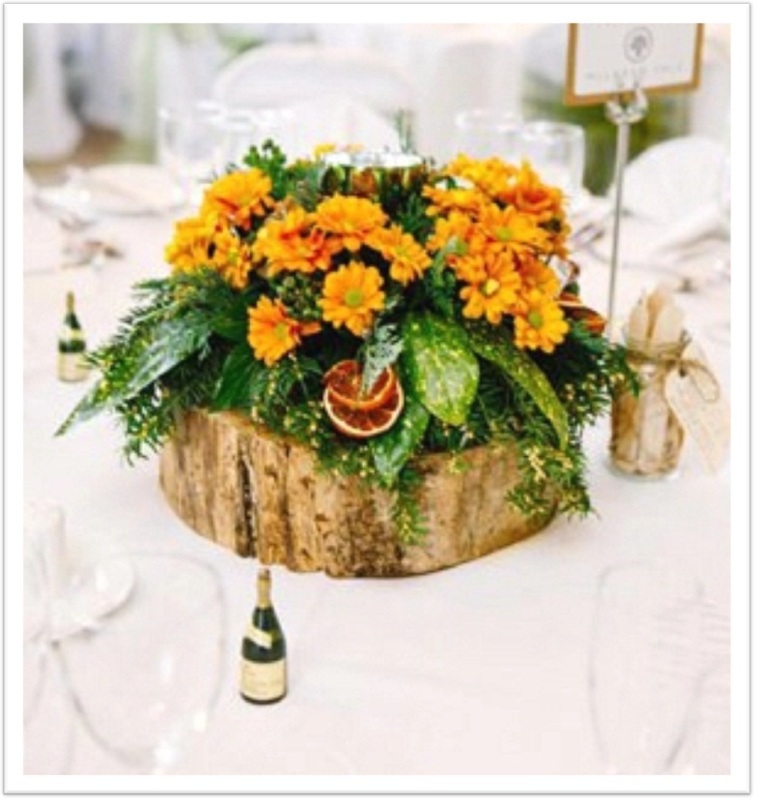 Woodenslices are available for sale online, and we are sure a florist would love to work with your theme; we all love a bit of a change after all! 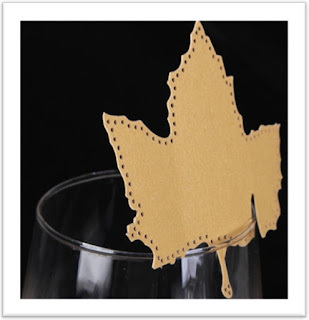 And for the final piece of the table puzzle, aren’t these wooden leaf decorations lovely?! They aren’t the cheapest, at £27.49 for 75, but you won’t need many. 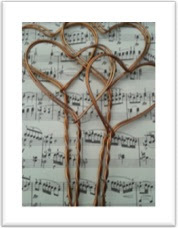 And we think it is the little personal touches like this that show how much thought you have put into your special day. 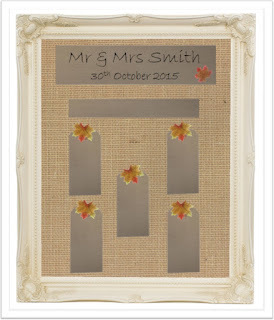 Fancy taking a bit further, why not give your flower girl a basket of Autumn leaves to scatter down the aisle? And if you are worried your guests will get cold, don’t. Embrace the weather! 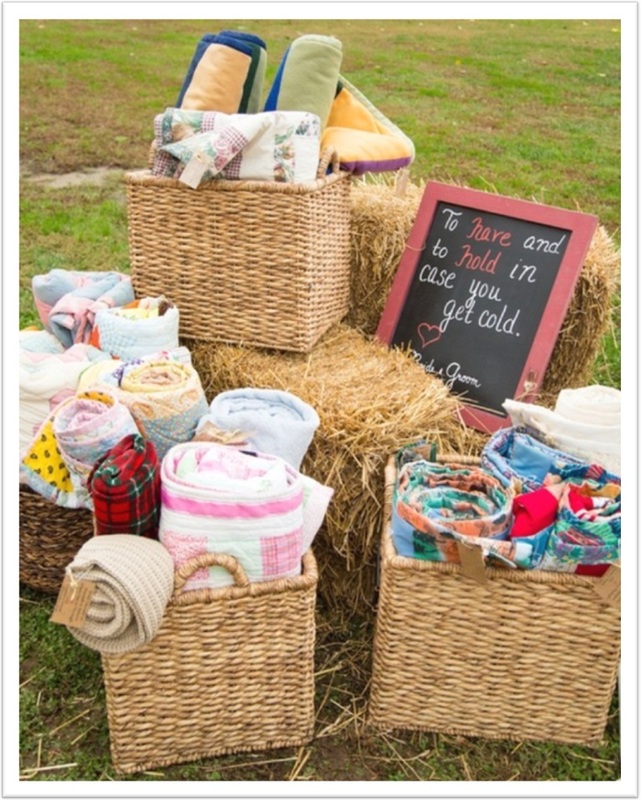 Crates and baskets full of blankets will look super cute, and is a lovely thought for the guest that didn’t bring a coat ‘cause it didn’t go with their dress… a decision most would come to regret! 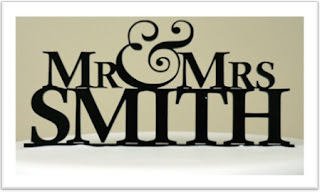 We would love to hear any of your wedding plans, maybe you could inspire a future months blog. Get in touch with us on Twitter @WeddingBBF, on Facebook Crowhurst Park Weddings, on here, in a comment below or email us on events@crowhurstpark.co.uk. Or why not follow us? It would be a shame to miss out on future wedding blogs from Crowhurst Park! 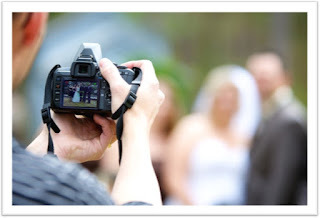 Wedding photography is just one of the areas we feel should be given due consideration when planning your wedding. What’s the right thing to do? Who do you trust? Do you find a professional or ask a friend/relative? Not everyone has the budget for a professional to be there for the day and luckily your best friend is a budding photographer and has kindly offered to take the snaps for you. Brilliant! Not only will this save you some pennies but chances are they are already a guest on your big day and will therefore be more than happy to see the whole thing through from beginning to end. With technology growing as it has over recent years, there are many fantastic cameras available at affordable prices now that will allow just about anyone to capture a clear picture, and if that’s all you’re worried about then this is the way forward! On the other hand, a professional photographer can be worth their weight in gold with their wealth of experience and their ability to know when they are needed and when to take a back seat and allow proceedings of the day to continue. Some people may look at the price of a wedding photographer and think that the money could be better spent elsewhere but just remember these pictures will be capturing your day for you to show to people in years to come, other than these all you have are your memories! A professional will also have the time and experience of editing photos so that they are of the highest standard possible and will show off what a fantastic day everybody had! Regardless of whether you decide to go professional or family/friend, we would always recommend taking your photographer to your chosen venue before the big day so that they can get a feel for the place and figure out where they think they could get beautiful pictures for you and your guests. The most important thing is that you trust whoever it is taking the photos and are comfortable enough with them to tell them exactly what shots you want taken on your big day, regardless of how silly you may think they are. We would love to hear wedding planning advice and tips from you, maybe you could inspire a future months blog! Get in touch with us on Twitter @WeddingBBF, on Facebook Crowhurst Park Weddings, on here in a comment below or email us at events@crowhurstpark.co.uk. Or why not follow us? It would be a shame to miss out on future wedding blogs from Crowhurst Park! Around the World on Your Special day! 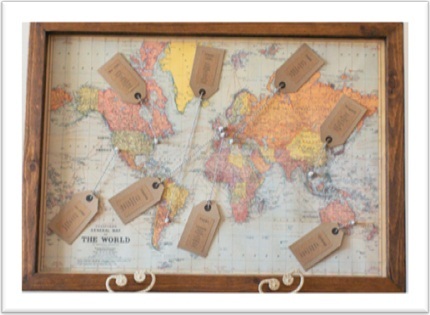 For this months themed wedding we thought we would give you a travel themed set up, after all, what else is better than a getaway with your h2b. 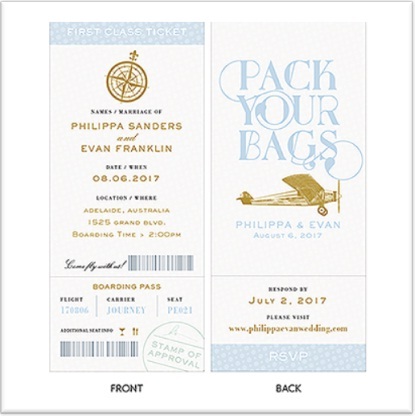 So let’s start at the beginning with the invites, and what better than a boarding pass invite, to start your around the world wedding. These lovely invites are also our colour scheme of bronze and sky blue (it must be meant to be), and are a steal at £30.24 for 54 invites. But what will the tables be called? With this fun theme the world is your oyster for table names, ‘cause numbers are just boring! 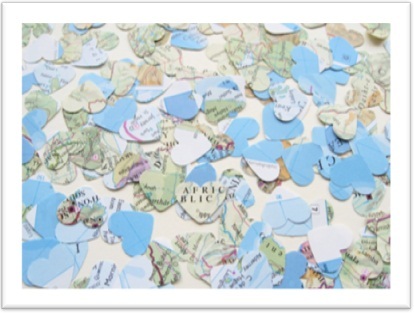 Postcards would look lovely, but for a bit of a more personal twist, why not put pictures of you in a city on each table? Display your table names in these cute bronze hearts, £1.60 each, to give the table a bit of height. Now let’s look at the guest book. Why have a book? Ask yourself, how often do you think you will blow the dust off and read the messages your tipsy guests wrote you? 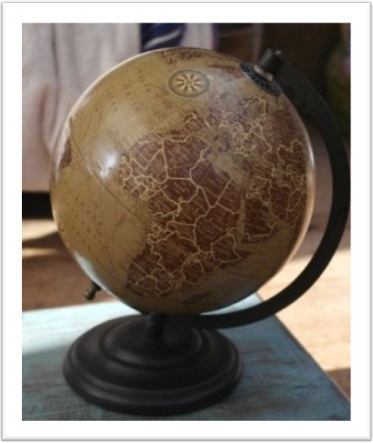 So why not have something you can display, like this globe (£28 with postage), it fits with the theme of the day and can be displayed in your marital home reminding you of your special day every time you look at it. 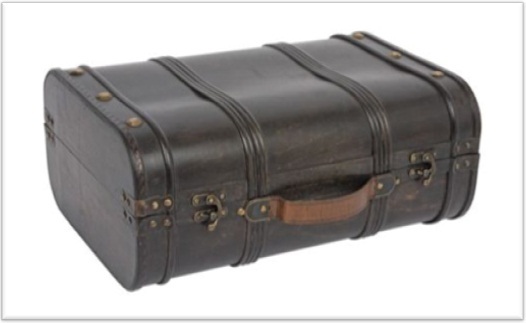 And next to your guest globe this rustic suitcase will work a treat. Displayed open for your guests to pop the cards to you, “the newlyweds”, in. This is £21.89, but again, could look great in your home, who doesn’t need extra storage! 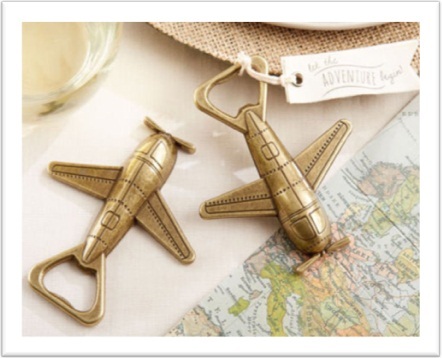 For the favour we love these bronze airplane bottle openers, priced at £1.98 each. We don’t know about you, but we can never find a bottle opener at home when we need one, so this favour is bound to not be left behind! 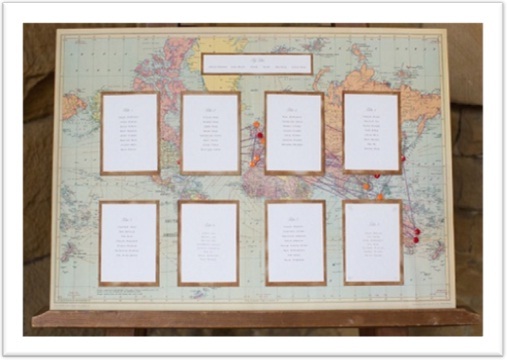 Your guests will know what table they are on from your table plan, but how will they find their seat? Name cards of course! And don’t these brown parcel tags look cute (£4.35 for 50), picture them, tied around the favour with this lovely blue and white twine (£1.25 for 5 meters), bringing a little more blue into the colour scheme alongside the blue chair sash and table runner. And for a little more colour map table confetti would look fab, tying the theme together a little bit more, and balancing out the colour scheme. Only £4.50 for 500, it will go far! 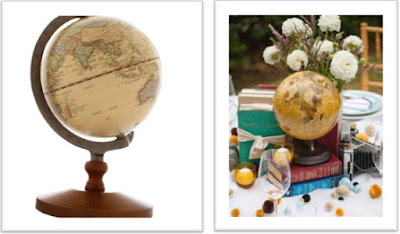 Now let’s finish with the table centre piece, and we loved the guest book globe so much, we think they would look brilliant on every table. But how about a slightly smaller version, at £15.66 each these are more budget friendly, and also as they are smaller wont dominate that table as much. Don’t they look fab with the vintage travel books providing the finishing touch! We would love to hear any of your wedding plans, maybe you could inspire a future months blog. Get in touch with us on Twitter @WeddingBBF, on Facebook Crowhurst Park Weddings, on here in a comment below or email us on events@crowhurstpark.co.uk. Or why not follow us? It would be a shame to miss out on future wedding blogs from Crowhurst Park! Summer is here! Yay!! Kids are off school, the weather is (supposedly) hot and sunny and days out to the beach are in. So we think that an interesting theme for an August wedding would be “a day at the seaside”. 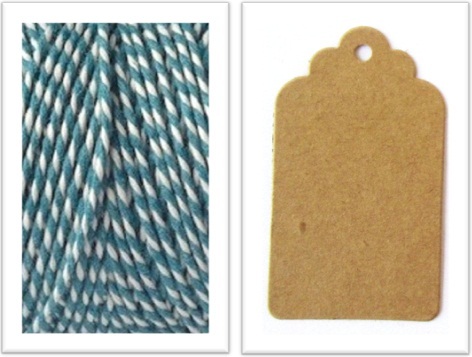 For our table runners and chair bows we would be looking at a bright aqua blue sash, get people thinking seaside thoughts! Invitations first. We love these sandy beach invites, and at only £37.50 for 50 including personalising of the front, that's a bargain! Next up, centrepieces. 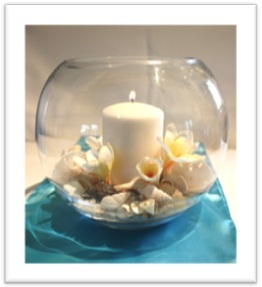 Picture a fish bowl vase filled with shells and stones finished with a tall candle in the centre. Simple but effective and completely accommodating a beach theme! We have found a picture below to help you picture it for yourselves! Table name holders, essential for guests to locate the table they are to be seated at! 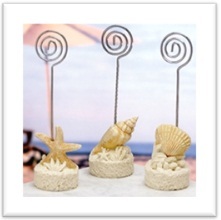 We love these shell based stands, they come as a set of 3 for £6.95, bargain! And to go in these fab holders, how about theme friendly table names such as beach essentials such as bucket and spade, or seaside locations. 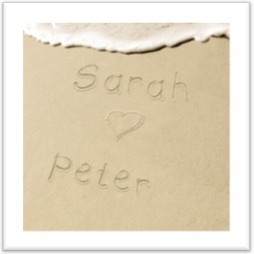 For name cards a personalised beach stone with the guests name printed on would make a lasting souvenir of your big day. 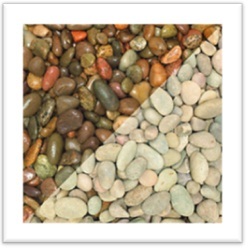 Bags of stones can be bought from may hardware stores or garden centres but we found www.wickes.co.uk had a good deal with a 25kg bag costing just £8.49 in brown or grey. Favours are an all important part of your day and we have a couple of ideas to suit varying budgets. 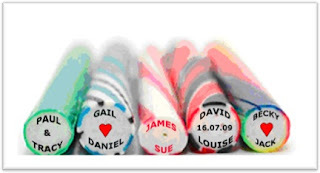 Our first idea is a personalised stick of rock for everyone with names of the bride and groom through the middle and the date your big day. These come in quite pricey at £210 for 50. If you’re on a tighter budget how about a rock sweet instead, 40 for just £10.99 and still personalised! With a variety of colours and styles available for either, these favours are sure to give guests something to talk about! Your big day wouldn't be complete without a book for guests to sign and leave their words of advice and congratulations. 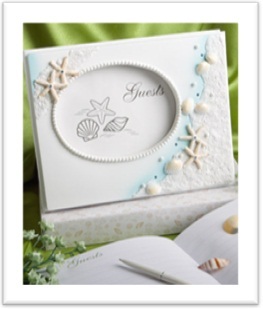 This beach themed guest book is just £13.99. Guest books create a lasting memory of your big day and are definitely worth including in your plans. Just before we finish here are some extra ideas for your big day. How about organising an ice cream van to greet everyone at your chosen venue? A welcome ice cream to accompany your drinks may well be appreciated on a hot sunny August day and will keep guests going until your meal is served. Or maybe change your wedding menu and fish and chips with mushy peas as a more informal sit down meal! With planning a wedding comes hundreds of decisions, and by the end you may just want to go with the standard just to make planning a little bit easier and to stop the cost getting out of hand! So here are a few parts of the wedding day to consider, making your special day both more personal and more memorable without breaking the bank. Let’s start with the ceremony. Civil wedding ceremonies are much shorter than Church ceremonies, so a great way to add a bit of personality is with a reading. And this bit of personality is completely free! This can be a reading with some meaning to you as a couple, and is a great way to get a friend or family member involved in your big day, after all, you can only have so many bridesmaids and ushers! While we are on the subject of the ceremony, let’s talk about the ceremony music. Most venues ask you provide a CD player and nominate a friend to play the music during your service *cough* Crowhurst Park doesn’t *cough*. A great alternative to this is a live musician, such as a guitarist. They will make popular music choices original too! Sticking with the ceremony, if you and your partner have young children, and they will be walking down the aisle as part of the wedding party a fab idea is this cute little sign for your little one to carry (or wear!) 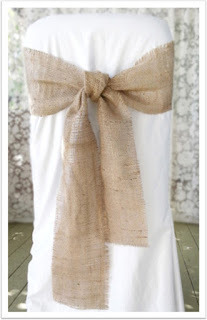 Fun and cute, this is a great way to set a more relaxed tone in your ceremony. Can you hear the “awwws” already? Another great topic for table names we have seen at the Park was numbers… *“what!” I hear you cry, “You said no to numbers!”*… but these were numbers related to occasions. Such as the number of football matches the couple had been to together, or the number of days they had been engaged. These numbers worked really well, watching guests with a quizzical face of “there aren’t 374 tables here” to the chatter when they saw where that number came from. And what is a wedding breakfast without food? If your venue offers you the chance of your guests having their own choice from the menu, then grab it! You may think it is more work in the run up to the wedding, I mean; you have enough to deal with, right? Having to send menus with invites, and then write the menu choices on the inside of name cards sounds like a hassle. But it is a lot easier than worrying about your fussy Aunt, and letting that influence what you want to eat on your day. Plus, it creates such a nice feel during the meal. You want to look at your guests from the top table and see them enjoying the food in front of them, not pushing it around the plate. 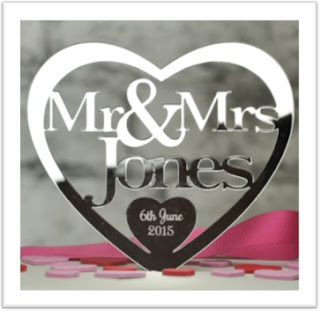 Sticking with food, a personalised cake topper is a great way of adding a bit of sparkle to a wedding cake, it is there to be looked at as well as eaten after all. 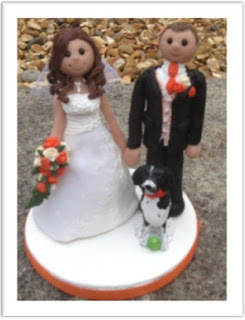 These cake toppers are great, and even better they are made from acrylic or clay so can be kept as a keepsake from the day. This is great for the budget savvy bride, why not buy a cheaper cake, such as from M&S or Waitrose, and make it special with one of these? As mentioned above music can make the day more personal and fun, not just in the ceremony, but also during the evening reception. By getting your guests to pick a song or two for your evening reception, they have no excuse not to be up on the dance floor from the start of the night, it is their taste in music after all! You could ask them to choose their favourite song, or a track that reminds them of you. You want your guests to begging the DJ for “just one more song!” as they don’t want the night to end. Time for one last suggestion… Photo booths are all the rage at the moment, and a great way to loosen your guests up. However, professional booths can be pretty expensive. 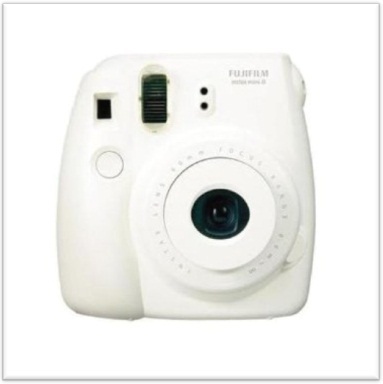 A great alternative is to buy a polaroid camera, you can get these for a great price on Amazon, and even better they hold their price if you want to sell them on after. A polaroid photo corner can also work as a fab alternative to a guest book, with guests sticking the photos they take into an album, and writing a message alongside, much more fun than a standard guest book. We would love to hear your wedding plans, maybe we missed a few little touches. Get in touch with us on Twitter @WeddingBBF, on Facebook Crowhurst Park Weddings, on here in a comment below or email us on events@crowhurstpark.co.uk. Or why not follow us? It would be a shame to miss out on future wedding blogs from Crowhurst Park!